Take the train to Middelburg. From there is a 20 minute walk to M5 Recumbents. After leaving the railway station main building you turn left and keep the water to your left. Also keep parallel to the railway, but do not cross it. After approximately a two kilometres walk in eastern direction you'll arrive at M5 on Arnestein II. From the railway station the route has a bicycle path and it's also possible to take the cheap Treintaxi (taxi's specially for train travellers). Buy your Treintaxi ticket together with your train ticket. 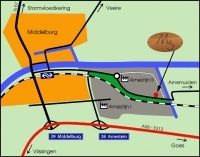 M5 Recumbents is situated directly at the rail road and on the business area Arnestein II. Coming by train from Roosendaal / Goes you'll be able to see the M5 building easily just before arriving at Middelburg train station. Coming from the east on the freeway A58 from Goes you take exit "Arnestein". Keep on following the road until you have crossed the railway and immediately turn right. Keep following the railway (it's on your right), take the right leg of the roundabout. After the roundabout it's a few hundred metres to M5.